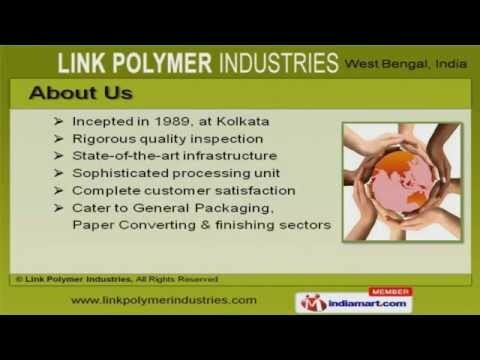 Welcome to Link Polymer Industries- the Manufacturer & Exporter of Emulsions and Adhesives. The company was established in 1989, at Kolkata. Our State-of-the-art infrastructure helps us to cater General Packaging, Paper Converting and finishing sectors. Market leading prices, premium quality products and packaging solutions make us the first choice of our clients. Our product list also covers Wood Working Adhesives and Adhesives for Synthetic Footwear. We offer Adhesives for Handicraft and General Purpose that are extremely reliable. Lamination and Pressure Sensitive Adhesives offered by us are available at affordable prices. Our Carton Packaging Adhesives and Emulsion for Construction Industry are widely acclaimed in the market. We also provide Adhesives and Binders for Paper Processing Industry that are best in the industry amongst others. Along with that we offer Emulsion, Binders, and Auxiliaries for Leather Industry that are class apart.